Do you know any Rising Business Stars? People in their 20s or 30s who either are business leaders or are well on their way? The Journal of Business wants to know for their upcoming 'Rising Stars' special section, to be published July 6. Send your suggestions to editor@spokanejournal.com before June 1. For the second time in the 100-year history of the Steam Plant, the building will be undergoing renovations that will bring new energy to downtown Spokane. The Stacks restaurant and brew pub located in the iconic building will be renovated and a new roof-top event center will be opened atop the structure linking the Seehorn Lang building and the Steam Plant. 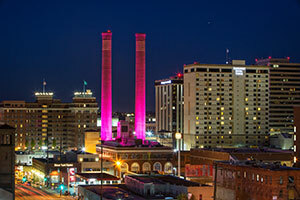 The two landmark stacks that light up the Spokane skyline will also undergo maintenance. The renovations will include a redesigned kitchen to gain operational efficiencies and remodel of the dining area and brew pub. The historical architectural elements inside the Steam Plant, such as the Coal Bunker, steam boilers and other original equipment will not be impacted by the renovations. To ensure safety during the $1.5 millon renovations, Stacks restaurant and the brew pub will close operations on June 1 with a reopening date planned for fall 2017. Businesses located in the upper area inside the Steam Plant and the adjoining Seehorn Lang building will remain open during the renovation. The Steam Plant Square Retail Shops located on Lincoln Street in the Seehorn Lang building will not be impacted. Local contractors for the renovations are HDG Architects and Associated Construction of Spokane. 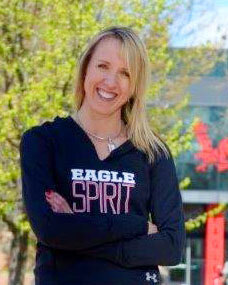 Lisa Poplawski has been the Director of Alumni Advancement at Eastern Washington University since 2005. In her 21 year career at Eastern, she has also held positions as the Associate Director of Admissions and Marketing and Communications. She is a member of the Big Sky Basketball Championship planning commission, the Leadership Spokane Alumni Board, and Wishing Star's Board of Trustees. Her current responsibilities include managing annual giving, a student call center, alumni relations and a volunteer, not for profit board. Most recently, her team participated in their first one day, social media campaign on #GivingTueday where they raised just over a quarter of a million dollars. Lisa graduated with a BA in Graphic Communications and a MEd in Adult Education from EWU. The City of Spokane is sponsoring Spokane's largest job fair on Wednesday from 11am to 2pm at the Spokane Convention Center. Dozens of employers have registered to be at the job fair. Admission is free for job seekers. Visit Spokane has announced that Kevin J. Twohig, CFE, Spokane Public Facilities District CEO, is the recipient of the Leadership Excellence in Tourism award. This award honors significant achievement and historically significant contribution by someone who has impacted Spokane's tourism industry for more than 10 years. The Leadership Excellence in Tourism award is determined by a vote of the Visit Spokane Board of Directors. Among Twohig's many accomplishments: Strong leadership in the expansion of the Spokane Convention Center; Improvements to the Spokane Veterans Arena; and Fostering partnerships with the Spokane Sports Commission. Students from EWU, SFCC and NIC participated in the event. Each student designed a poster-sized, folded piece to showcase Lawton's new press. The pieces educate clients about variable data printing, one of the press' signature capabilities. Variable data allows marketers to use personalization to achieve true one-to-one marketing to clients. A record sixty-five students submitted designs, which were judged by a panel of local and regional industry, design and marketing professionals. This marks the fourth year for the Lawton Design Scholarship. Financial support for the scholarships was given by Lawton Printing Services, the PPIA (Pacific Printing Industries Association) Educational Trust, Caty Colberg and Brian Jones. Mohawk was the paper sponsor again this year, providing the paper used to print the student pieces. Crown West Realty, LLC announces the promotion of Dean Stuart to Vice President of its Spokane operation and General Manager of the Spokane Business and Industrial Park. Stuart has been with Crown West since 2000 and is responsible for overseeing the leasing of Crown West's portfolio of over six million square feet of industrial properties. Additionally, he manages the design, development and implementation of all Crown West marketing activities. Oliver Lawrence has been promoted to Asset and Development Manager for the Northwest Division of Crown West Realty. Lawrence is responsible for asset management and construction and capital project management for Crown West's extensive portfolio of real estate and water systems. He oversees new development, renovation, remodeling, infrastructure, and tenant improvement projects. His additional responsibilities also include property management functions and tenant relations for nearly seven million square feet of industrial, commercial and office properties. Mr. Lawrence has been with Crown West since 2002. Chase Breckner has been promoted to Leasing Manager for the Spokane Business and Industrial Park and is responsible for new business development for the Northwest Region. Breckner has been with Crown West since 2004. The West Plains Chamber of Commerce will hold its monthly membership meeting, this Wednesday, May 17, at Tawanka Commons at Eastern Washington University. During the breakfast, members will hear from students who are studying to become the next leaders in Science, Technology, Engineering and Math - STEM, and will hear about EWU's STEM program. The membership meeting runs from 7:30-9am. Matt Mercer is currently providing drafting, design and construction support for the BCT Complex, Unaccompanied Enlisted Personnel Housing at Joint Base Lewis-McChord, Wash.; a multi-tenant retail center on Appleway Avenue in Coeur d'Alene, Idaho; and other various projects. Mercer, who holds an Associate of Arts and Sciences degree in Computer Drafting and Design from ITT Technical Institute, has 17 years' drafting experience. He previously served as a lead draftsman for Monsef Donogh Design Group in Renton, Wash. Serving as the financial liaison between project managers and the office manager, Tonya Wollschleger sets up projects in the accounting/project management system; ensures that processes and procedures for contracts are followed; and prepares invoices, budget updates and project management reports. Wollschleger, who has 17 years' experience in accounting, is an alumna of Charleston Southern University. She was formerly employed as an accounting specialist with Next IT in the City of Spokane Valley. In addition to organizing the interior design department's materials resource library, Tara Anderson assists with assembly of color boards and project submittals. She also helps maintain and populate portions of the firm's marketing database. Anderson's professional experience includes serving as a case administrator for the Chapter 13 Trustee's Office in Spokane. She holds an Associate of Arts degree in General Studies from Spokane Falls Community College. Spokane SCORE Chapter 180 presents its next workshop on Strategies for Small Business Marketing & Sales. Gain insights into how to identify prospective customers, how to attract them to your business, and how to get them to buy your products and services. Workshop will be held this Wednesday, May 17 from 5:30 to 9:30pm at 2916 N Monroe St, Rogue Heart Media. For more information and to register, visit www.scorespokane.org.